"I just cant stay away from my Man Cave!". Busy at work on the Kickstarter. I have over 20 years experience in Animation and 3D. I wasn't finding time to play Warhammer 40k. My hobby time was non existent. So I decided to channel my spare time into the things I love. Being around my family, spending time in my man cave and challenging myself to learn something new. I really enjoy that feeling of discovering new possibilities and developing my skills. So even though this is work, it still feels like a hobby to me. Checking the build platform before setting off another 3D print. I use the FormLabs Form2 resin SLA printer. I originally started to go down the route of MDF terrain and was about to invest in a laser cutter. However due to its limitations, I decided to go a step further and invest in one of the best resin printers on the market. 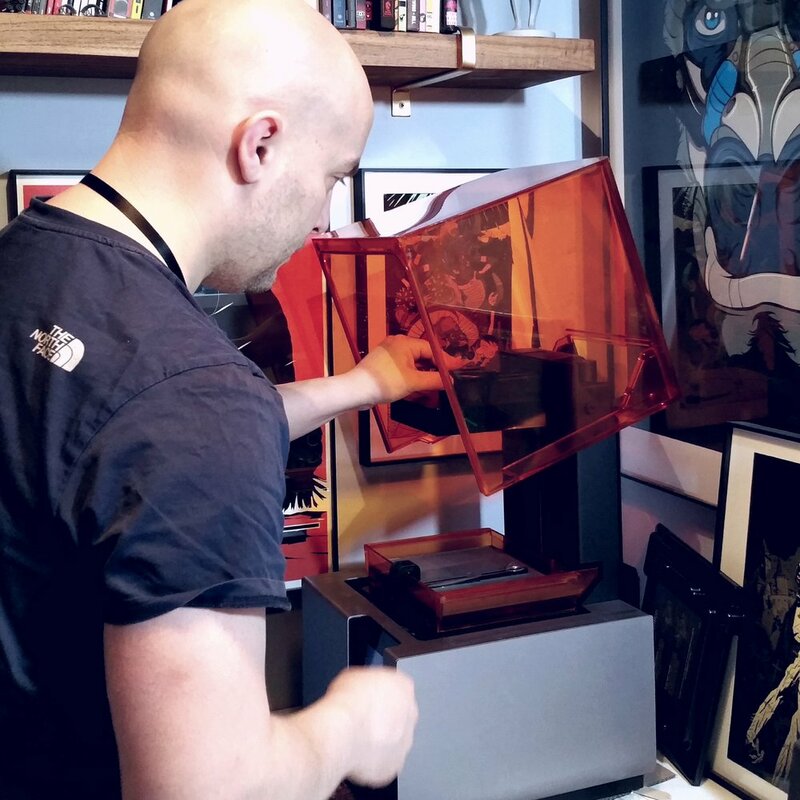 The FormLabs Form 2 has proven to be a worthy investment, and it allows me to fulfil my visions. From here, producing master prints, we are able to move to the next stage of silicone moulds / resin casting with the knowledge that we have achieved exceptional detail. Its versatility then sparked the idea for the Custom Name Plates. Cleaning the 3D print master - before moving onto silicone molds! I need to be a perfectionist in my day job. I have been taught to learn from my mistakes and never give up. Consumers also expect the best. That's why its so important to get things right. Each custom name plate, has been refined multiple times. If something is not quite right, it will go back and print it again. What you will see in our work, is a combination of 2 years research, daydreaming and passion. Animation is my original passion, and I'm a professional VFX animator in my day job.. Below are some of the shows I have worked on.